This page was last updated April 21, 2011. INVITE TO 2010 EUKANUBA !!! out of the BBE class!! Kushinda's Burner being shown in Marietta OH by Davis ! (left) GCH D'Artagnan & Burner (right)! (left) CH Xena & GCH D'Artagnan (right)! YES, I am interested in a puppy! YES, I would like to adopt a Ridgeback today! 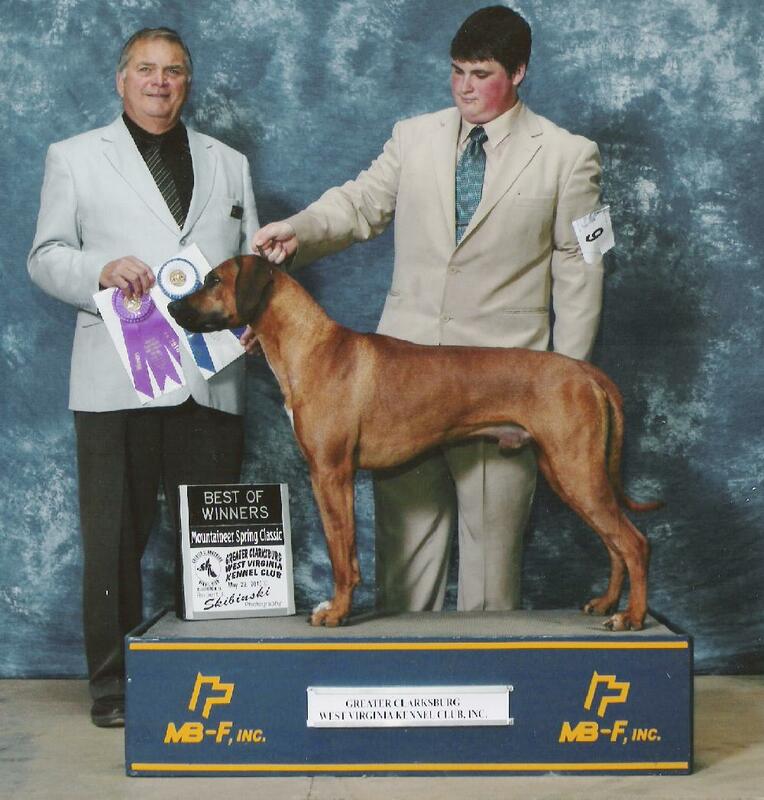 Cecil is a proven stud dog and currently has grand-get in the ring: Burner, Dandy and Falkon! Cecil's COI is 16.8% and he stands 26 1/2 inches at the whithers. Cecil weighed in at 77.2 pounds on February 29, 2008. OR email Kammi@pobox.com for services! ... otherwise known as "One of the The Black Boys!, brings to Kushinda a deep dark wheaten color and a black mask (complete with mascara!). Standing proud at 27 inches and weighing in at 82 pounds, Chabonette is just beginning his performance careeer. As you will see below he has stamped several of his pups with his gorgeous head! In the ring, so far he has a second place out of the puppy class in October 1997 and he was pulled in the Open class by Mrs. Canalizo at the RRCUS 67th National Specialty. December 16th, 1999 he was entered at the Cleveland Dog Shows. So watch for him! or stop by to meet him! In the field, he also took a 4th place in his stake at the 67th RRCUS Specialty. Currently Van I has one 4 point major towwards his AKC FIELD CHAMPIONSHIP and over 50 points with two first place win towards his ASFA FIELD CHAMPIONSHIP. Check out VanI's pedigree. See more of Chabby-Doo on his personal home page! 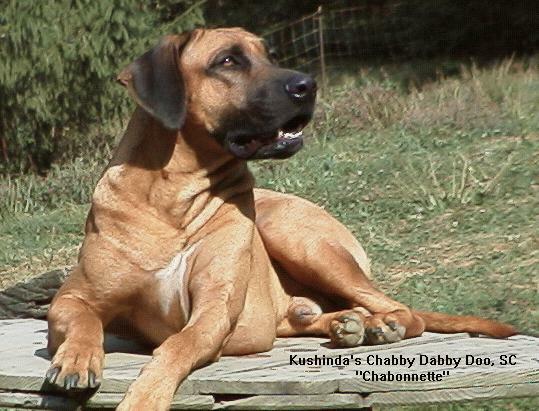 Chabonette's pedigree is provided by Rhodesian Ridgeback Pedigree Online Search Tool (POST) courtesy Meandu Ridgebacks. Other pedigree-related information may be requested by contacting Kushinda. Color: Red Wheaten, Liver Nose, 26", 85 lbs. We selected Jean-Claude from his litter when he was only five weeks old after chasing the moving spoon in the puppy food saucer. At the tender age of six weeks he made his day beau on television with his brother Rudy (owned by Kathy Strick who is just starting his coursing career) as a therapy puppy in training! He also loves to show and completed his conformation championship with three, 4 point majors. But he lives to lure course, earning his prequalification certificate on Nov 13, 1994. 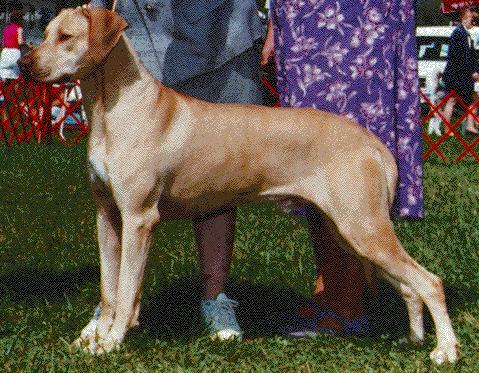 A fast maturing dog, he ran in his first trial that day and took Best of Breed. The chase instinct is innately strong in Jean-Claude. On the coursing field Jean-Claude is intent on catching the bunny, with good follow, enthusiasm, and great ability. He is a short bodied dog with extraordinary muscle definition. He is very agile and demonstrating his ability the first time he ran at "The Wall" (Coastal Corsers, New Windsor, MD). Here the dogs must jump, twist and turn sharpley while going down hill as well as up hill. He has mastered these skills and now exhibits them daily in our backyard and on the coursing field. It has been thrilling for us to watch him develop. At home he is a true wonder, never ceasing to amaze us each day. He is not an alpha dog (leader of the pack) but has learned to respect his Uncle DC Kushinda�s Ben (finishing #29 in ASFA) and is amiable with all the other males. A couch potato by nature, he hates being cold. 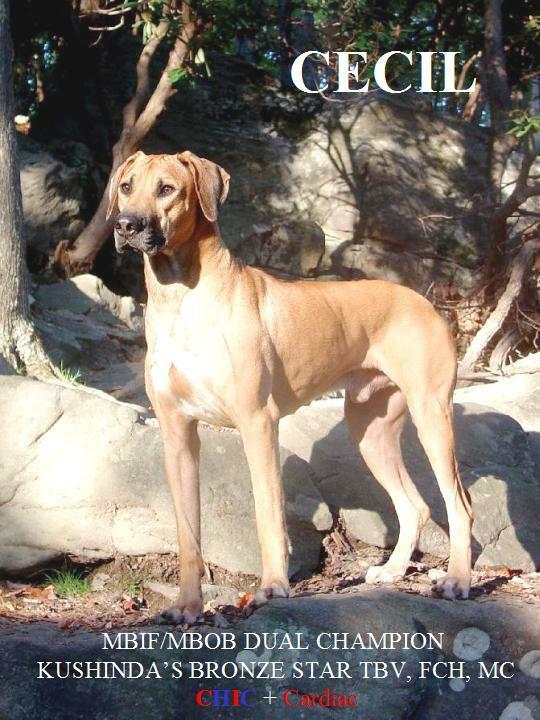 He is a protector in the true sense of the Ridgeback as he silently watches the property and house. Truly the test of the Functional Ridgeback is the ability to demonsatre his capacity for companionship and love to others in need! Currently, Kushinda Dogs are responsble for nearly 1000 individual therapy visits a year! It is indeed a special dog that will hunt the lion and kiss the face of a stranger! The majority of all bunny-related tropies/prizes won by Kushinda are donated to Kammi�s Therapy Program and are eventually given to nursing home/hospital Residents at Easter each year. Conditioning at Kushinda is one of our favorite past times, beginning with a special diet, daily exercise, regularly scheduled practice sessions between trials, and a constant dedication to maintaining their physical and mental health. 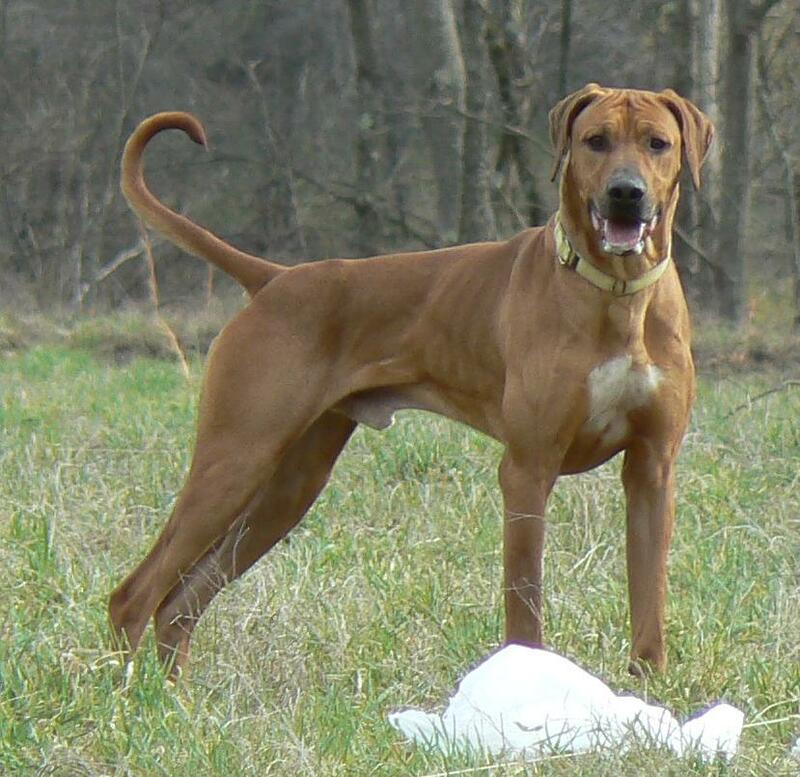 An overweight, under toned, bored Ridgeback is unhealthy for coursing, and should not be run (even for practice) until this situation has been corrected. 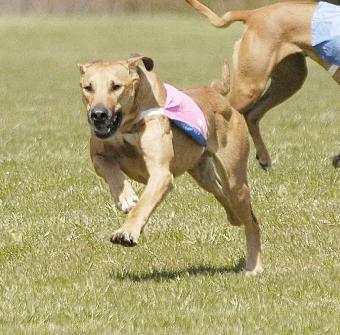 It is our opinion that Ridgebacks either possess the coursing instinct or they do not. You cannot teach them how to course. If your puppy runs on the coursing field this will give you some idea if he has the coursing instinct. What we have taught them is how to improve the desire they possess: give them ample opportunity to experience puppyhood first (physically and mentally), teach them basic obedience (a Ridgeback that will come to you makes the sport very enjoyable for the owner), and rigorously condition them (physically and mentally). Their instinct to chase must then be nurtured with constant training and supervision as a coursing Ridgeback is likely to chase anything that moves. You must provide the proper environment, love, companionship, and the opportunity! It has been a truly amazing experience blazing the trail for the coursing Ridgeback. 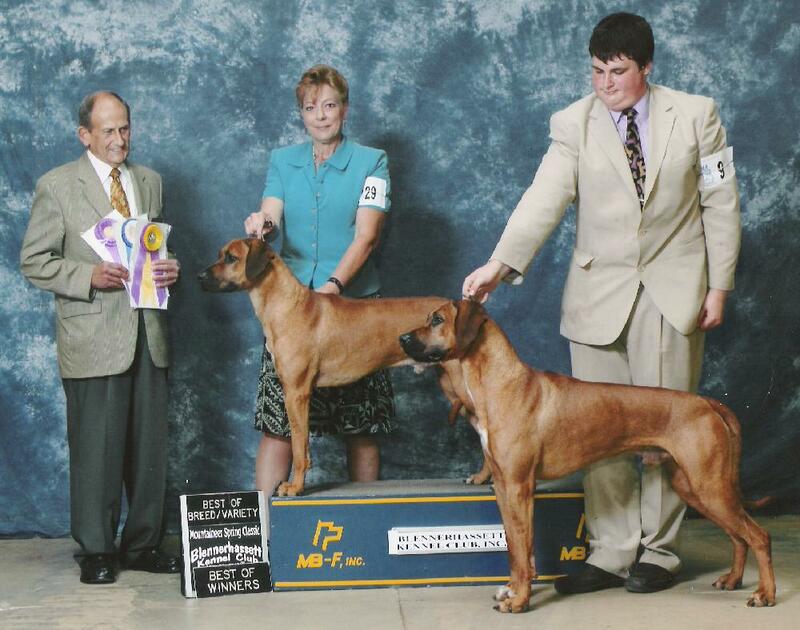 Jean Claude�s Grandsire, Ch Mshindaji�s Rahisi of Kushinda earned his JC when he was eight years old and is the sire of the top winning lue coursing Ridgeback in the history of the breed, MBIF DC Red Chisel �s Plum Bobbi, LCM4. 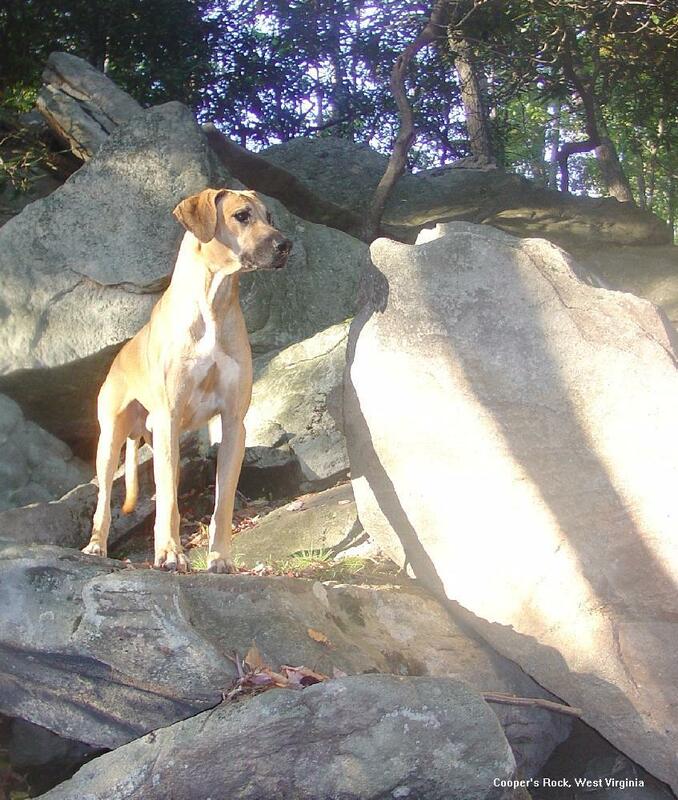 The first and only Ridgeback having earned an LCM2, LCM3, and LCM4. 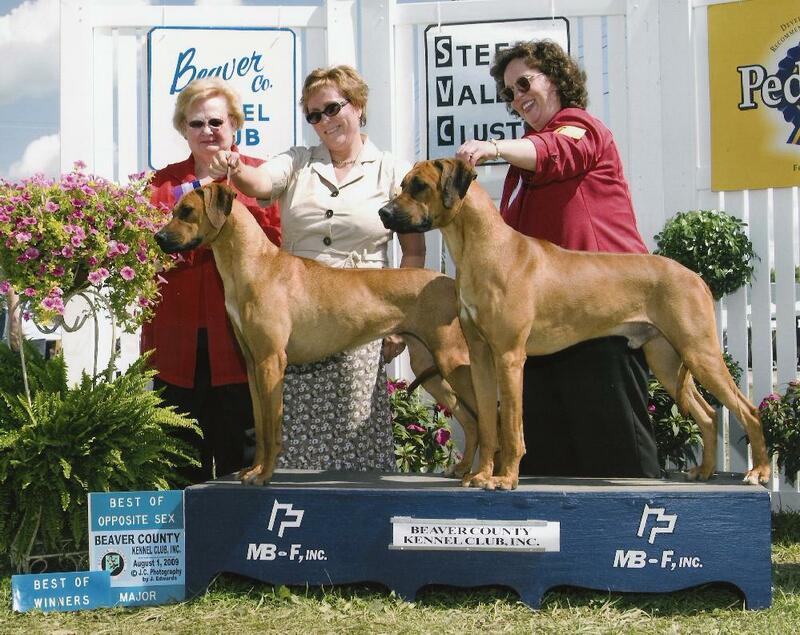 Jean Claude�s sire TikTok and dam Spice are both avid lure coursers. His father Kushinda�s Rahisi TikTok Jasri, FCh, CD, SC, CGC/TDI is truly the all round performance dog! Tikker is an alpha dog ready for the challenge in whatever manner it manifests itself! His mother FC Kushinda�s Secret Spice, CGC/TDI OFA-G AKC#4 is a quick courser with the ability to make tight turns. His brother BIF Kushinda's Design by K Kru (Theodore), FCh ranks #7 in ASFA & #5 in AKC. 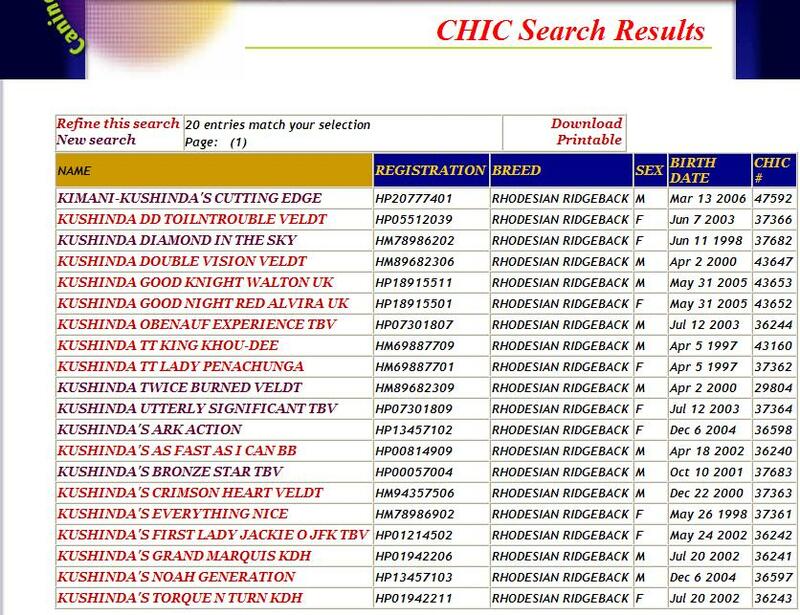 His half sister MBIF FC Kushinda�s Archive Angel, LCM (Gwen) ranks #2 in ASFA & #2 in AKC. Both dogs having been conditioned at Kushinda have the everlasting endurance required to earned BIF with 5-6 runs in a single day! 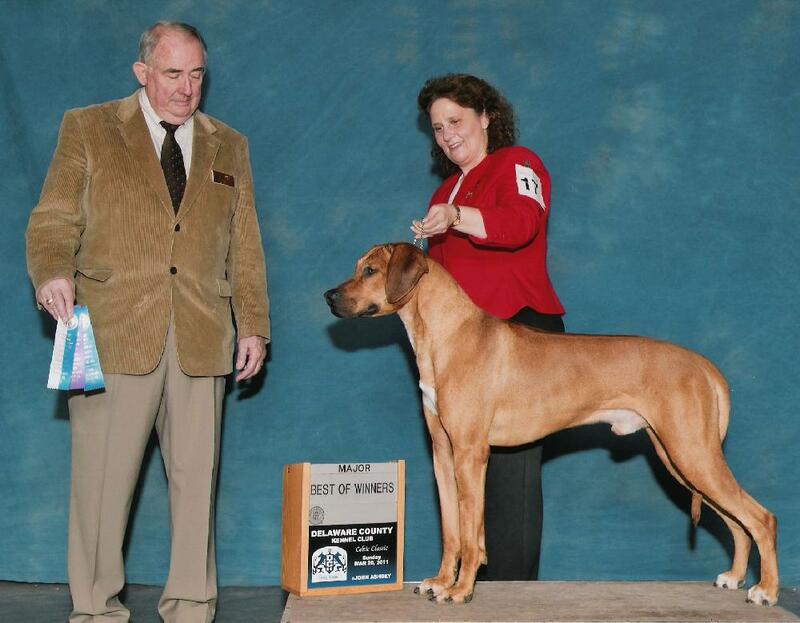 In 1995 Jean-Claude ran in 14 trials (6 ASFA and 8 AKC) ranking #9 for AKCand #18 for RRCUS (The Rhodesian Ridgeback Club ofthe United States). 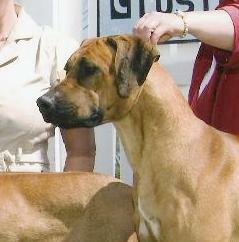 For 1996 Jean-Claude holds the #1 position in ASFA, AKC and RRCUS. 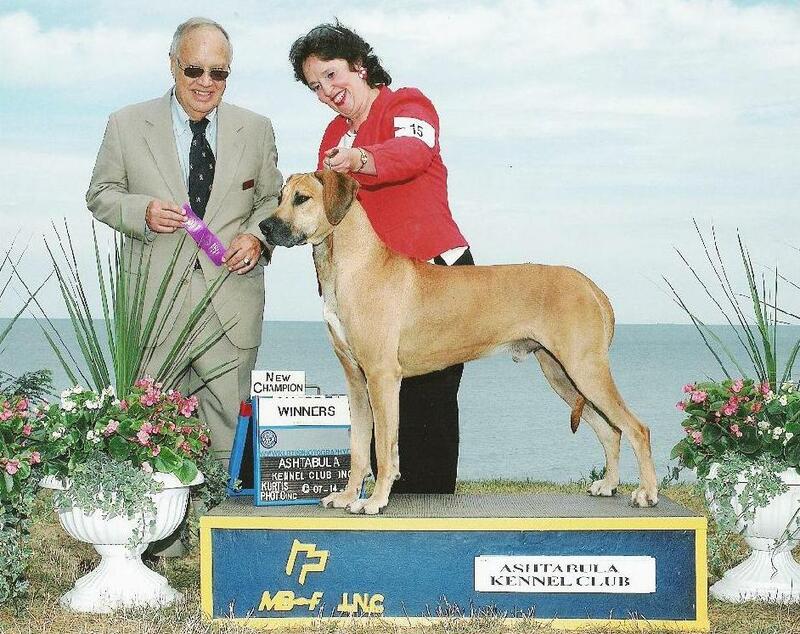 1997 brings a new competitive year for Jean-Claude in lure coursing as well as few vistits to the obedience ring! He is truly the fully-Functional performance Ridgeback as well as a wonderful, loving pet! He is pictured (taken by Bonnie Johnson) here at Allentown, PA at the 1996 RRCUS 65th National Specialty with 137 dogs in competition. Where he took BOB under judges Denise Como and Larry Flynn. 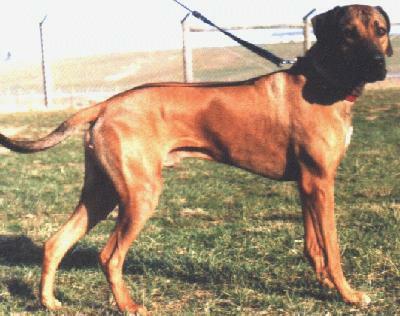 Jean-Claude's pedigree is provided by Rhodesian Ridgeback Pedigree Online Search Tool (POST) courtesy Meandu Ridgebacks. 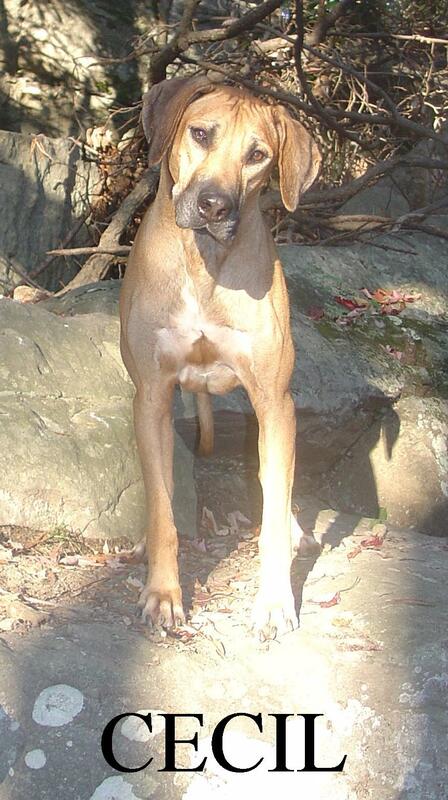 TikTok's pedigree is provided by Rhodesian Ridgeback Pedigree Online Search Tool (POST) courtesy Meandu Ridgebacks. ... otherwise known as "The Black Boy!, brings to Kushinda a deep dark wheaten color and a black mask. Standing proud at 27 inches and weighing in at 82 pounds, VanI is just beginning his careeer. 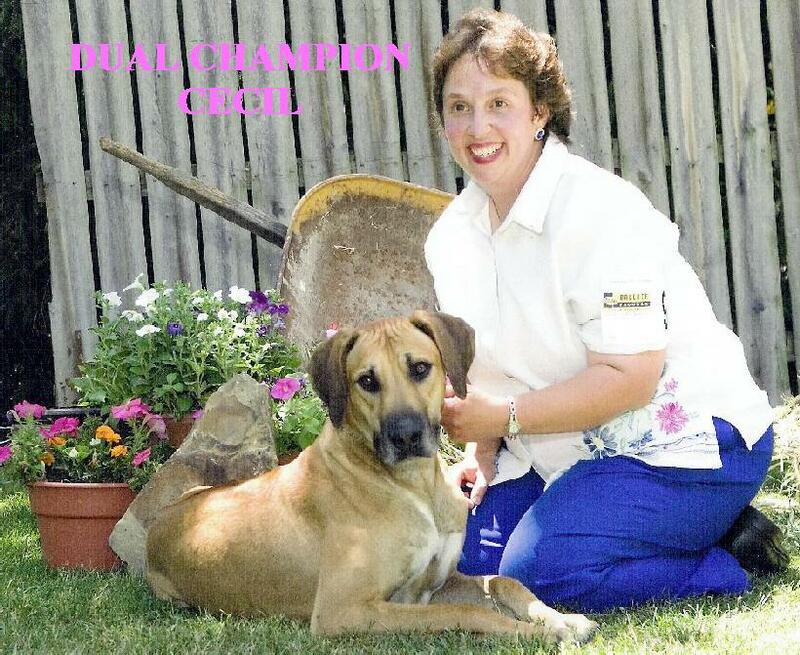 In the ring, so far a second place out of the puppy class in October 1997 and he was pulled in the Open class by Mrs. Canalizo at the RRCUS 67th National Specialty. In the field, he also took a 4th place in his stake at the 67th RRCUS Specialty. 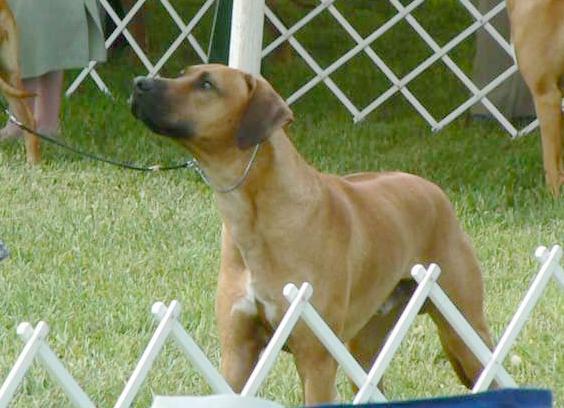 Van Isaac's pedigree is provided by Rhodesian Ridgeback Pedigree Online Search Tool (POST) courtesy Meandu Ridgebacks.